You'll be amazed at the range of materials you can fix with Tear-Aid Type A repair tape. Gives you a durable, flexible, airtight, watertight, puncture-resistant patch. No muss, no fuss, no mess. The matte finish polyurethane tape is exceptionally tough and abrasion resistant. It stretches and springs back without losing its grip. The aggressive adhesive on the tape is formulated for a high strength bond to a wide variety of surfaces. It doesn't turn gummy in the heat. Repairs holes and tears on Pennel Orca®, Hypalon, rubber, most fabrics, fiberglass, nylon, most plastics (including polyethylene, polypropylene and polyurethane), non-oiled leather, aluminum, and stainless steel. Available in kit form or in rolls of 3"W x 5'L The see-through tape works with all colors and won't discolor over time. It's easy to use. Cut the patch to shape, clean the surface to be repaired, and stick it on. No muss, no fuss, no mess. 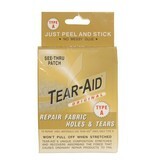 Type A Tear Aid is not recommended for Vinyl or PVC. For these materials, use Type B Tear-Aid, Item # 1981.